Marie Callender’s menu prices at your fingertips. In the early 1940s, a professional baker, Marie Callender started a small pie business. She delivered pies to restaurants and later on started her own eating place that sold lunch, dinner specials, and her classic pies. Today, Marie Callender’s pies and restaurants are well-known with over 75 locations in America and Mexico. Below are the latest Marie Callender’s menu prices. Marie Callender’s offers local charities, schools, and organizations two ways to raise money. Through their fundraising program, organizations can raise funds via the ‘Whole Pie Fundraiser’ or the ‘Dine in for Dollars’ fundraiser. To help promote schools and student achievement, local schools can participate in the ‘Award of Excellence’ program or the ‘Appetite for Reading’ program. Interested parties should contact their local Marie Callender’s location. Marie Callender’s famous pies include classics such as the Lemon Meringue Pie for only $7.99. The Kahlua Cream Cheese Pie is filled with a special taste of Kahlúa mocha throughout the velvety cream cheese in a chocolate cookie crust. Customers crave for sour cream apple pie, which is full of baked apples, sour cream topping, sprinkled with cinnamon and buttery pecans. Marie Callender’s restaurant specials are the Parmesan Crusted Sole, or grilled Parmesan crusted sole fillets, topped with creamy Alfredo sauce which is served with rice and fresh asparagus. The crispy jumbo shrimp dinner is a dish of home-style breaded jumbo shrimp fillets fried to a crispy, golden brown and served with chips and fresh almond coleslaw. This eatery offers an all-you-can-eat soup and salad bar, as well as hamburgers, barbecued ribs and classics like pot roast and meatloaf. 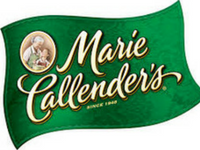 For more information about Marie Callender’s, visit their official website. Does Marie Callender’s have Happy Hour? Yes, Marie Callender’s does have Happy Hour. Monday – Saturday: 3 PM – 10 PM and all day Sunday. Locations offering Happy Hour may vary, please check your nearest location. Where is the pie menu and prices? Each year the price of their pie has gone up. This year they say the sale price is $8.99. That’s not a sale price! I remember when the price was $5.99. Even if their pies are good, I will not pay that price. I can make mine for less. And knock off recipes are on Pinterest. Thanks but no thanks Marie Calendar.